This post was sparked by a Twitter message from @lettersfromswe asking about information on my typeface Göteborg. Here is an account of how the Swedish Modern Set of typefaces (Stockholm, Göteborg and Uppsala) came to be and the obstacles and misunderstandings along the way. 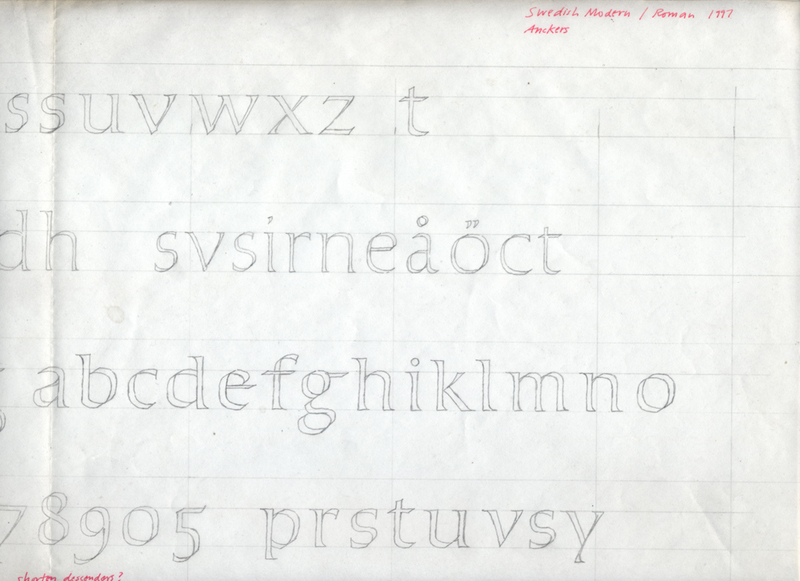 Initial sketches for the Swedish Modern Set (November 1997). 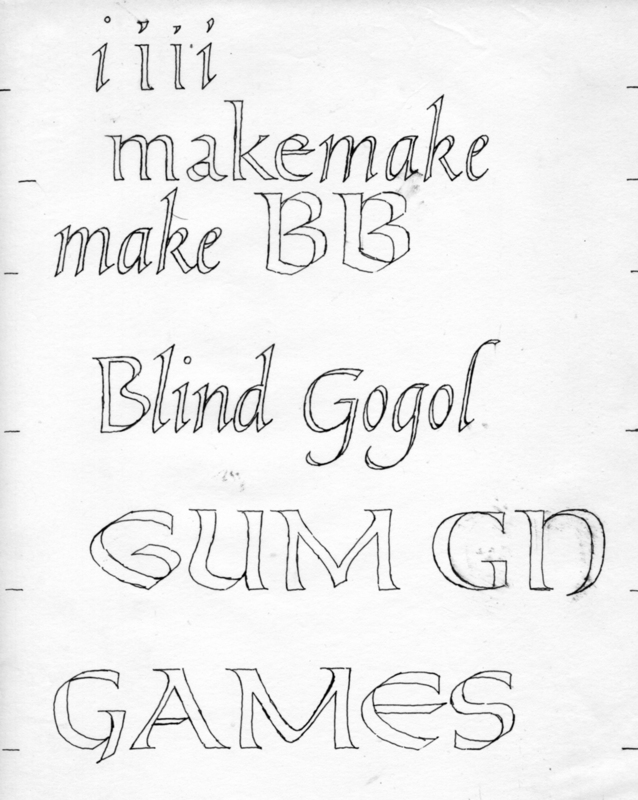 During the 1997 ATypI conference in Reading, England Allan Haley, then working for Agfa/Creative Alliance, asked me for some ideas for new font designs. I suggested that someone look to modern Scandinavian calligraphy for inspiration. I had in mind the distinctive work of Karl-Erik Forsberg (1914–1995) (designer of the typefaces Berling and Carolus), Erik Lindegren (1918–1996), Herbert Lindgren (1919–1987), Kerstin Anckers (b. 1931), Bo Berndal (b. 1924), Sven Höglind, Vera Johnsson, Vidar Forsberg (1921–1992) and Jan Olov Enchage from Sweden; Leif Frimann Anisdahl (b. 1937) from Norway; and Erkki Ruuhinen (b. 1943) and Hannu Palaasma from Finland; and Erik Ellegaard Frederiksen (1924–1997) and Bent Rohde (b. 1928) from Denmark. I had ﬁrst come across their work as a teenager in ABC of Lettering and Printing Types, a trilogy edited, designed and printed by Erik Lindegren Grafisk Studio in Askim, Sweden for Museum Books in New York (1964) when my great aunt gave me volume A (lettering) as a Christmas gift. 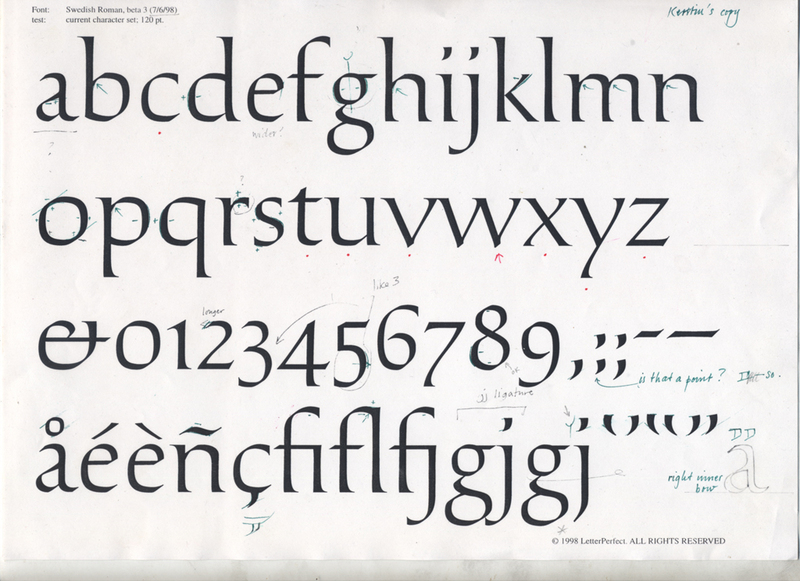 I subsequently purchased volumes B (typefaces) and C (handwriting) when I attended Reed College. After I moved to New York City I acquired the original fat one-volume Lindegren anthology entitled Våra bostäver: Tecknade och textade alfabet, boktrycktyper, reklam- och accidentstrycktyper (Göteborg: Skolan för bokindustri, 1959–1960) and a newer slim one-volume English version published by Pentalic Corporation in 1976. 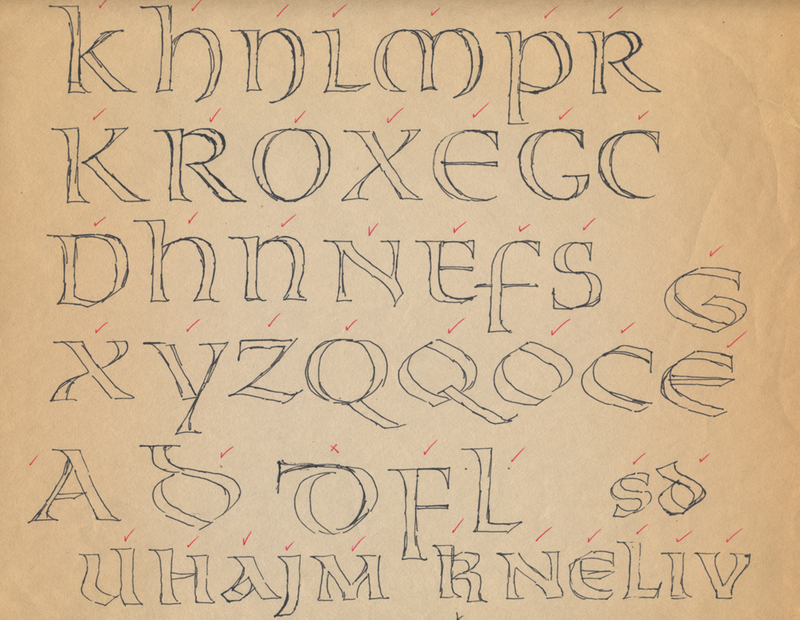 Later, in the early 1980s I discovered Ruuhinen’s and Palaasma’s work—neither of whom were included in Lindegren’s various anthologies—while organizing the Calligraphy and Lettering in Graphic Design competitions for the Society of Scribes, Ltd. I also met Gun Larson (b. 1940), a student of Forsberg’s, who was living in New York and working for American publishers, especially Random House, in the 1980s. 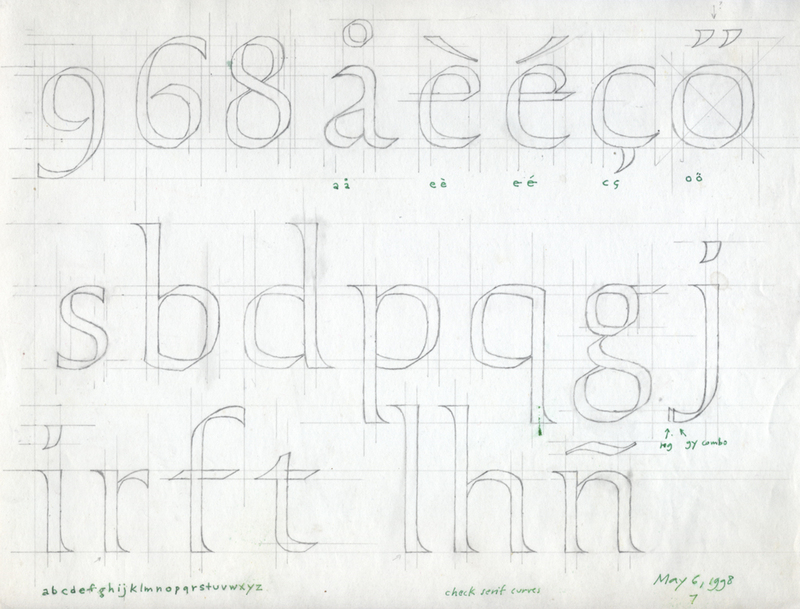 The calligraphic work of these Scandinavian designers—they were designers ﬁrst and calligraphers second—was different from that found in England where Edward Johnston’s inﬂuence still held sway through the 1980s, in Germany where Rudolf Koch and F.H.E. Schneidler had spawned schools and Hermann Zapf had established a strong personal style, and the United States where several individuals (W.A. Dwiggins, George Salter, Ray DaBoll, James Hayes, and others) had idiosyncratic styles but none of which were predominant. The Scandinavian style was cool, crisp and, somehow, both classical and modern. It was not overtly expressive. 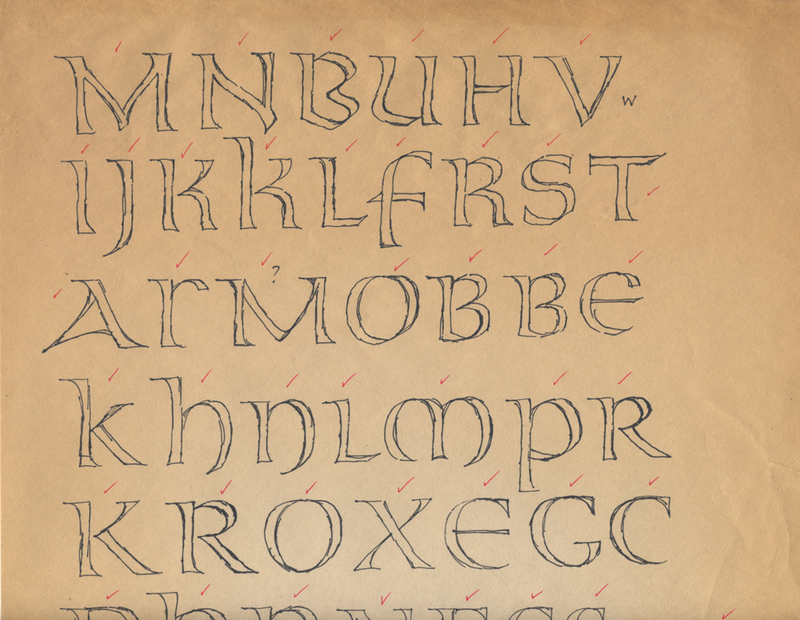 It was also virtually unknown outside of Scandinavia, even to those in calligraphy circles since the Lindegren books were hard to get and the focus of the calligraphy world was principally on England and secondarily on Germany. All of this suggested to me that a set of fonts based on this Scandinavian calligraphy might be something fresh and new. Although I could only describe the style to Haley, he immediately liked the idea. So I suggested that he get in touch with various people in Sweden and Finland to carry out the fonts. Instead, to my mortiﬁcation, he said that he wanted me to design the fonts. I acquiesced only after he (and Agfa/Creative Alliance) agreed to pay for me to go to Sweden to do research on the original lettering models and meet with some of the calligrapher/designers to get their approval of the project. I wrote to Kerstin Anckers in early November 1998 outlining the project (with some initial sketches) and explaining the ﬁnancial situation between Agfa/Creative Alliance, LetterPerfect and myself. She responded warmly, providing me with information on the archival status of materials by Forsberg and Lindegren and contact information for Forsberg’s widow Geith and Erik Lindegren’s son Anders. She was interested in the project but in a subsequent letter (2 December 1997) she had some comments about my preliminary sketches. “I don’t like my own &. The three capitals B K R as well as the ﬁgure 3 should have a similar angel [sic] B K R 3 [drawn with long descending legs on K and R] or B K R 3. I think you have lowered the ascenders a little too much. Your version of 5 is better than mine!” But individual letters were not the real issue. From the moment I was in touch with her, Geith Forsberg and Anders Lindegren, it became clear that my initial forebodings about taking on this project were warranted. There was confusion over the exact relationship among the three typefaces, over the specific models for each, over the moral/legal rights involved in making typefaces based on someone else’s calligraphy, and over royalties for the resulting typefaces. These problems were compounded by the fact that I was caught between Agfa/Creative Alliance and the Swedish calligraphers. While I saw the three typefaces as independent designs that were being bundled together in the manner of Lithos, Trajan and Charlemagne, Haley was hoping that the roman and the italic could be paired—even if they were sold separately. To that end he urged me in early December 1997 to adjust the weights and x-heights. All of this was conveyed to Kerstin. In January 1998 she began helping me arrange a visit to Stockholm to meet her and other Swedish calligraphers and designers. …I understood [sic] that the project is asked for by Agfa and that they will pay you. Then you called by telephone and wrote me a letter of 27 Nov. where you say that you feel I deserve a fee—out of your (Letter Perfect’s?) pocket, not Agfa’s because the contract is between Agfa and you. Actually I can’t understand this. I believe, but may be wrong, that you will be payed [sic] on a royaltybase [sic] from Agfa. From a European thinking it would be natural to pay the royalty with some more percents [sic] to you and some less percents [sic] to me and the others involved, how much depending on the agreement made. That all people who work with letters do it out of love is very familiar to me. No one who is out for earning much money is so crazy that he or she believes it’s possible by doing calligraphy! …I think we all have the copyright of our works out of the Swedish law—but also that the letterforms themselves not yet are protected outside of Germany. All this is very complicated and I hope it will clear up in time. I have heard a little about a kind of loose association in USA called TypeRight for protection of the typedesigners [sic] works. It sounds to be a good thing and we [Kerstin, Geith et al.] would be glad if you can tell us something about it when you are here. I responded to Kerstin’s letter with a clariﬁcation of the situation both monetarily and aesthetically. Garrett would like to call the roman design Nobel as an aid to sales…. It was the Samuel Beckett award that I have seen… However, I also based my drawings on your alphabet in the International Calligraphy Today exhibition catalogue  and a page from Lindegren that says Svenska… (with lighter letters). 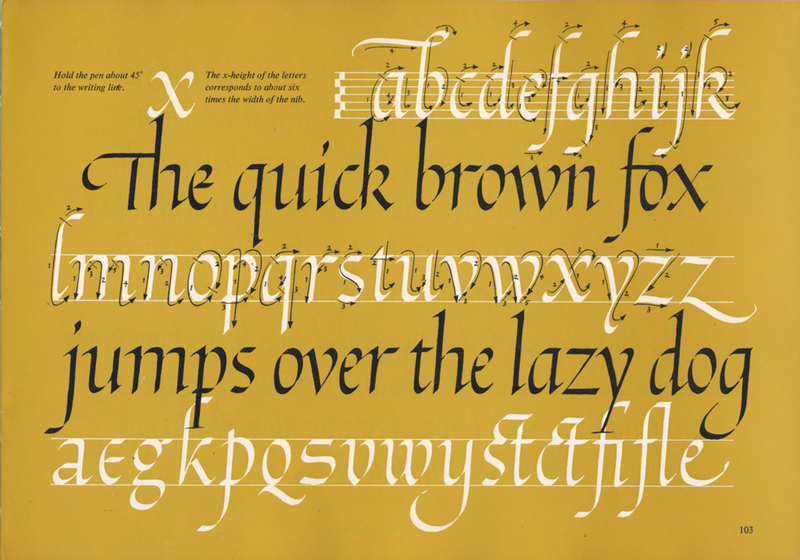 The italic is based on several examples by Erik Lindegren in the various editions of his book on calligraphy, lettering and type. I like the very light weight examples the best, but I have heavied the letters up because type has to work at a variety of sizes. On another related manner: I have proposed to Agfa that a brochure be designed to promote the 3 typefaces. 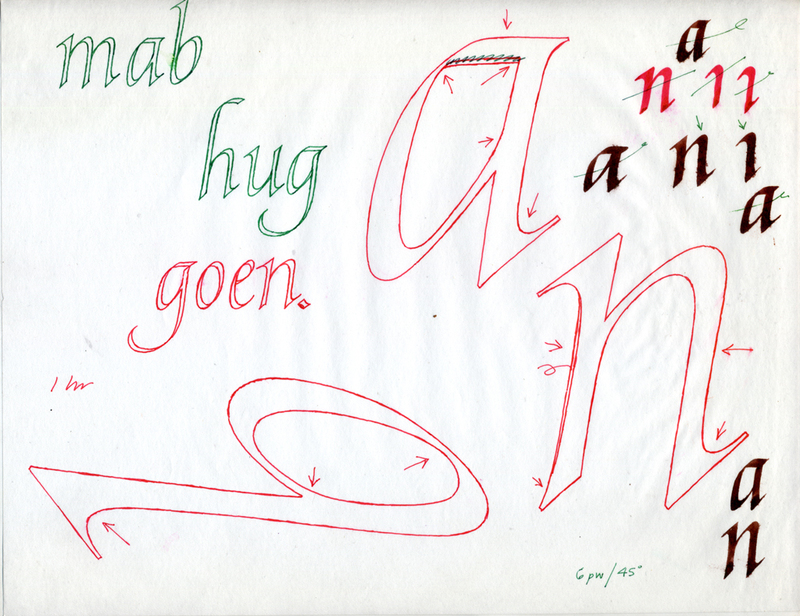 I would like to proﬁle you, Erik Lindegren and the Swedish calligraphers in general. But I would like to do this in the context of modern Swedish design in general: furniture, graphics, industrial [sic], architecture, etc.… My idea is to help sell the typefaces by showing people this connection. The brochure would only be 24 pages or so at an A4 or A5 size. Agfa has never done this before but Garrett and I have done it with our last two groups of typefaces.… At the moment Agfa is holding off their approval. But if I can afford it I would have a brochure printed with or without their help. This letter seemed to put Kerstin at ease as she agreed to my explanations about the money and the separation of the roman and the italic typefaces in her letter of 21 January 1998. “…I am very happy that Erik’s and my letters not will be [sic] will be mixed in one alphabeth [sic],” she wrote. “I feel it is a way to honor Erik too, which I really like, also because [of] our long and good friendship.—I promised Anders to take a close look on your scetches [sic] and digitallization [sic] of what is based on Erik’s hand.” Her opinion of my work on the roman typeface had mellowed—a bit. “I like the relationship between the capitals and ascenders in your example Cha in the fax of 5 Dec., ” she said. “But what about the (what do you call them?) lower ascenders (?) of g j p q y? I hope you make the upper part of g smaller than the other and that the whole letter goes a little deeper than the others. I would also like the letter j without the hook. In Swedish we rather often have the combination of gj; gjorde.” (In response to this letter I designed a gj ligature.) She also said that she liked my idea of making a brochure. Kerstin’s letter continued with a lengthy exigesis about the capitals. “I was a little too quick in my comments of the letters B K and R. Please excuse me! But I agree with you that K never looks good if the angle is too soft, but there is a difference between too soft and too sharp,” she said. She also warned me that making the B R 3 5 & would be difﬁcult: “They very easy [can] look like sick pears”. She thought that her capitals in the Samuel Beckett award were not very good and that they should not be a model. That was the last letter from Kerstin prior to my trip to Scandinavia, at Agfa/Creative Alliance’s expense, in late March of 1998. In Stockholm I met Bo Berndal, Kerstin, Örjan Nordling (b. 1958), Lars Laurentii (b. 1941), Ludvig Grandin (b. 1950), Marie Anikó Györi and other members of the Swedish calligraphy group. In Uppsala, I met Geith and visited the Karl-Erik Forsberg archive at Carolina Rediviva (Uppsala University Library). I then took a train to Oslo to meet Christopher Haanes (b. 1966), an English-trained calligrapher, before returning to Sweden and visiting Gun Larson at her home near Malmö. The last stop on my journey was Copenhagen where I met Bent Rohde. During my time in Stockholm and Uppsala I discussed the Swedish Modern Set project with Bo, Kerstin, Geith and several others, repeating the royalty situation with Agfa/Creative Alliance and LetterPerfect, and showing them the progress I had made on each of the three typefaces. When I left Sweden I felt I had gotten the support of Kerstin to make Stockholm and Geith Forsberg to make Uppsala (based on lettering in various ex libris designs by Karl-Erik Forsberg as well as an uncial alphabet by Herbert Lindgren and some lettering by Erkki Ruuhinen). (By mail I had already secured the approval of Anders Lindegren to make Göteborg, based on his father’s various italic samples.) 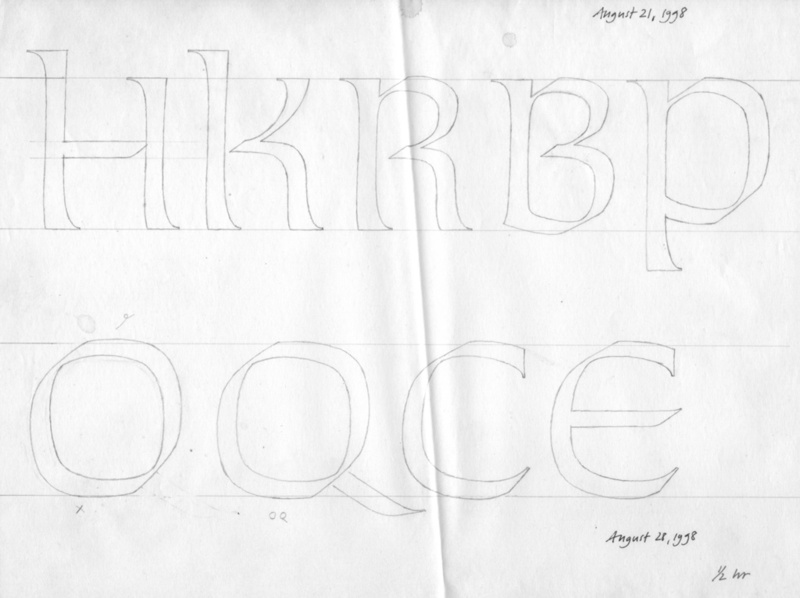 When I returned from Scandinavia I ﬁnished drawing the three typefaces and sent them off to Garrett for digitization. The results were sent to Kerstin in July. Garrett and I worked to adjust the letters in accordance with Kerstin’s detailed comments. New proofs were sent to her and her response was “Your work looks all over good.” This was in a letter of 31 July 1998, the last one I received from her. After this Garrett completed the digitization of the roman along with that of the other two fonts over the following three months. The three typefaces—named Stockholm, Göteborg and Uppsala after Agfa/Creative Alliance balked at the working names—were released at the end of October 1998. A week later I received a fax from Bo Berndal obliquely reporting on disapproval of the three typefaces by some of the Swedes involved as well as others I had met during my trip to Stockholm and Uppsala. Geith Forsberg was apparently unhappy that the design partially based on her husband’s work was being packaged with typefaces based on other people’s work. She did not want his name to be used in any promotions of Uppsala or of the entire Swedish Modern Set. Niklas Eriksson of Fontbolagetfound the U in Uppsala to be too “Russian-looking” and not “Swedish” enough. Bo himself thought that I had failed to capture Kerstin’s “fluent, round forms” in Stockholm’s capitals. He felt it was too close to Forsberg’s Carolus. Allan Haley apparently received some criticism or complaints about the fonts as well, though he did not give me speciﬁcs. All of this led Agfa/Creative Alliance to cancel any ideas of doing a special brochure to promote the Swedish Modern Set. Instead, they allowed the typefaces to be released quietly, without even a basic press release. And without any mention of the Swedish calligraphers whose work had inspired their creation. Consequently, the fonts have not only ﬂown under the radar, but the story behind them has never been fully told. One problem that bedeviled the development of the Swedish Modern Set were the differing assumptions and expectations of those involved. Agfa/Creative Alliance was simply looking for some distinctive typefaces to release. I was trying to honor modern Swedish calligraphers by turning some of their letterforms that I admired into fonts. But those that I liked were not exactly the ones that Kerstin Anckers and the heirs of Karl-Erik Forsberg and Erik Lindegren liked. Despite my attempt to work with Kerstin and incorporate her critiques into Stockholm—and to a lesser extent into Göteborg—both faces were doomed to fall short of her expectations. Although I am saddened at the response the typefaces received—especially that the ﬁnal criticisms by her and others were not made directly to me‡—I still like all three, especially Göteborg which I feel is unique among stand-alone italic fonts. As for the money, my offer to share my part of the royalties was never revisited. In the end I received little or no royalties from the three fonts. During the time that I was a partner with Garrett in LetterPerfect he graciously gave me a percentage of the royalties on all of the fonts in the library, most of which he had designed. Those that I designed or co-designed which made money were Bermuda and Old Claude. Since 2002, when Garrett bought me out, I have received no royalties on any of the fonts I designed. If any money has been made from the Swedish Modern Set in the past decade only those at Monotype Imaging (the successor to Agfa/Creative Alliance) and Garrett know. I doubt it has been much. Finally, the moral/legal issue of designing a typeface based on the lettering or calligraphy of another person was never completely addressed during my visit to Sweden or after. 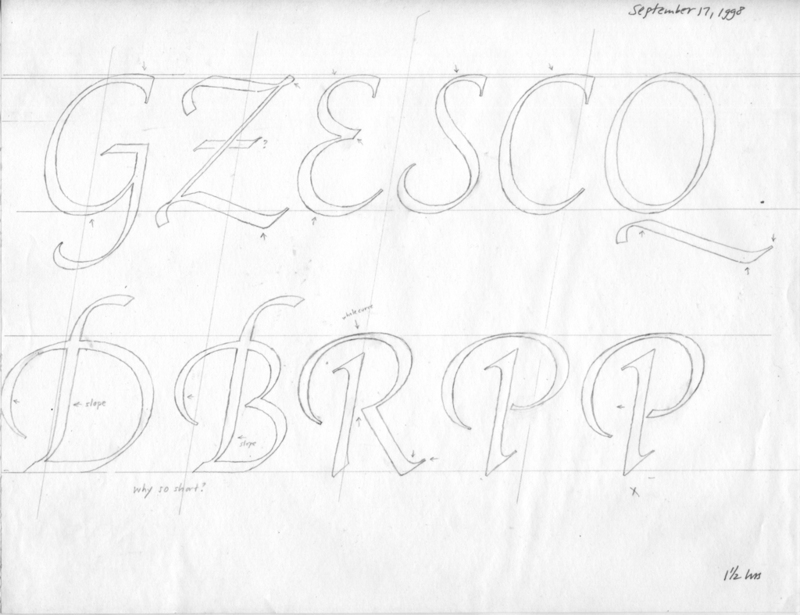 The later correspondence with Kerstin focused solely on the design of the letters for Stockholm and Göteborg. But her comments at the outset were accurate. Typefaces are only protected in Germany. In the United States the software underlying digital fonts is protected, but not the designs themselves. And letters have never been copyrightable except as part of a larger design such as a book jacket or poster. 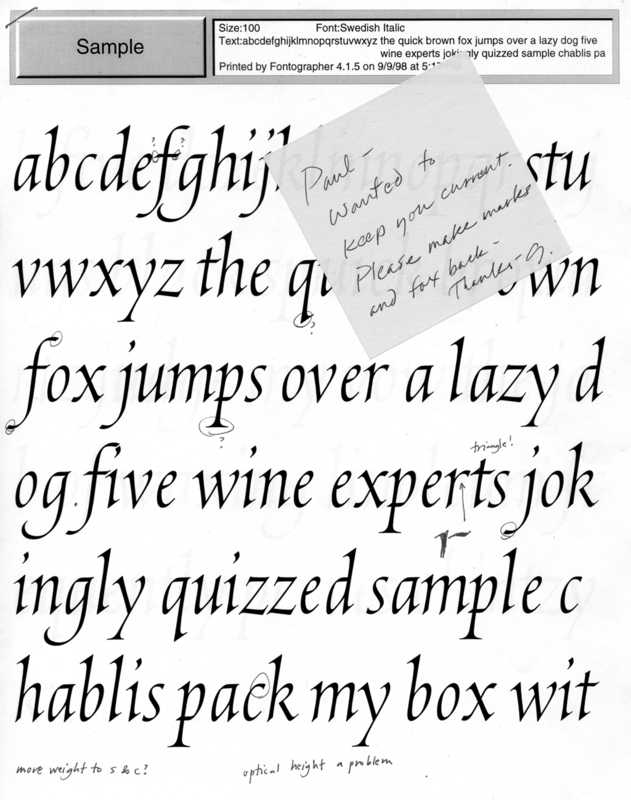 Thus, there is no legal obstacle to designing a typeface based on someone else’s lettering or calligraphy. However, many Europeans believe there is a moral issue at work in such instances. I was aware of that from the moment that I suggested the Swedish Modern Set to Allan Haley, which is why I wanted to gain the approval of Kerstin Anckers, Geith Forsberg, Anders Lindegren et al. I thought I had achieved that in my correspondence and personal meeting with them. And I took Kerstin’s lengthy critique of Stockholm as a signal that she accepted least that part of the project and, since she was often speaking for the others, of the entire enterprise. In the end, the story of the Swedish Modern Set is a cautionary tale of good intentions gone awry. *In my early January 1998 letter to Kerstin I wrote, “I am willing to split this [my part of the LetterPerfect royalty] with you in whatever way you feel is fair. 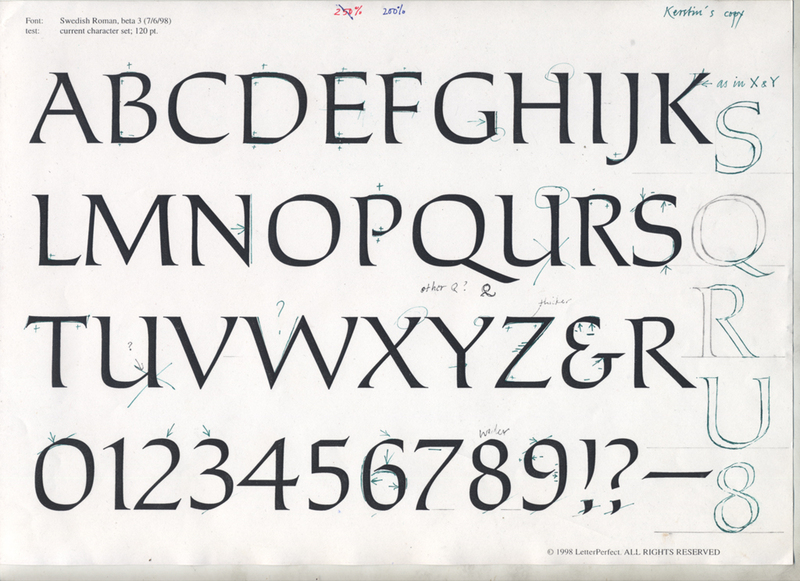 You would get a royalty on the roman design and Anders [Lindegren] would get a royalty on the italic design. 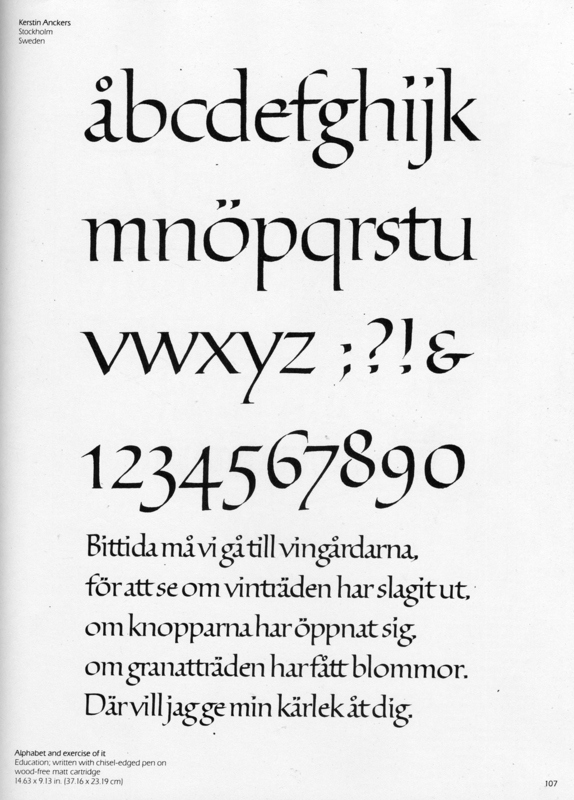 The uncial design is my own amalgamation from various sources and so the royalty should entirely be mine.” At the time they were released, each of the Swedish Modern Set typefaces was priced at $30 which meant a royalty of $1.12 per font sold to Kerstin and Anders. My initial inspiration for the Swedish Modern Set came principally from the various books that Erik Lindegren published between 1959 and 1976, supplemented by some material in International Calligraphy Today, the catalogue of the 1981 exhibition organized by the International Typeface Corporation and some work submitted to the Calligraphy and Lettering in the Graphic Arts exhibitions sponsored by the Society of Scribes, Ltd. After my trip to Scandinavia, I also relied on photocopies of book jackets and other graphic ephemera from both the Forsberg archive at Uppsala University and old issues of Form, reputedly the oldest design magazine in the world, and Graﬁskt forum. During my trip I acquired many books on Swedish type design and calligraphy, including Verba volant, littera scripta manet: Orden förflyger det skrivna består, a 32-plate lettering portfolio by Erik Lindegren [Askim: Erik Lindegren graﬁsk studio, 1994], and Skrift: handledning i kalligraﬁ by Karl-Erik Forsberg and Geith Forsberg (Stockholm: Norstedts, 1986), two books I had not seen before. However, neither contained calligraphic samples comparable in quality to the earlier books and thus they played no role in the design of the Swedish Modern Set. 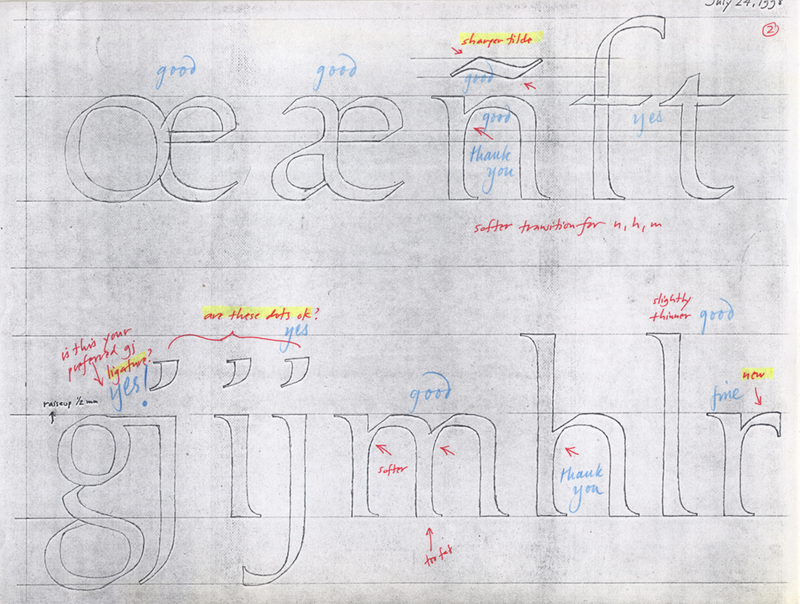 Early exploratory sketches (November 1997) for Uppsala based on uncialesque letters in the works below. In these exploratory sketches for Uppsala I did what I did with Kolo and Donatello: I gathered as many examples of the basic letterform I wanted to base the typeface on as I could, drawing them freehand. 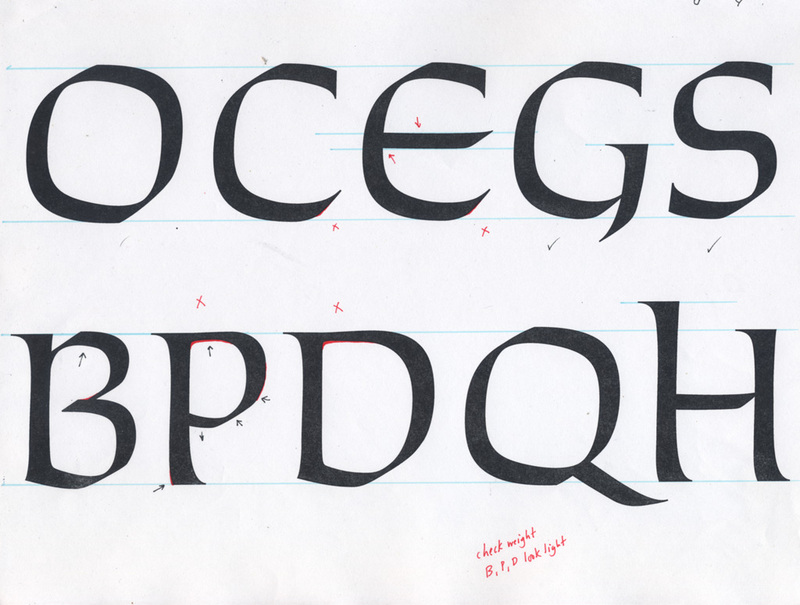 The next step was to see which letters were worth pursuing from the perspective of a homogeneous typeface. I think the checkmarks here were simply done to count off the letters of the alphabet so I could see which ones were not present in the examples and thus had to be invented from scratch by me. At the bottom are some tests of what a bolder typeface might look like. It was never pursued beyond this. 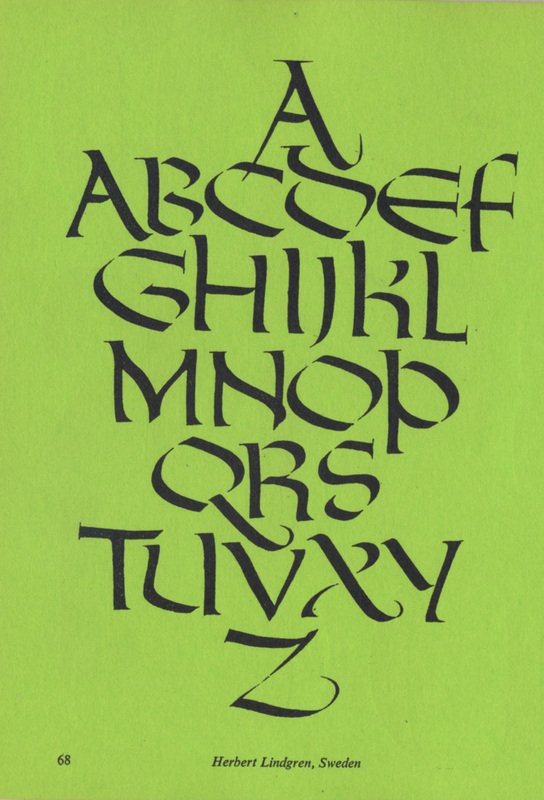 Uncial alphabet by Herbert Lindegren from ABC of Lettering and Printing Types by Erik Lindegren (New York: Pentalic Corporation, 1976), p. 68. 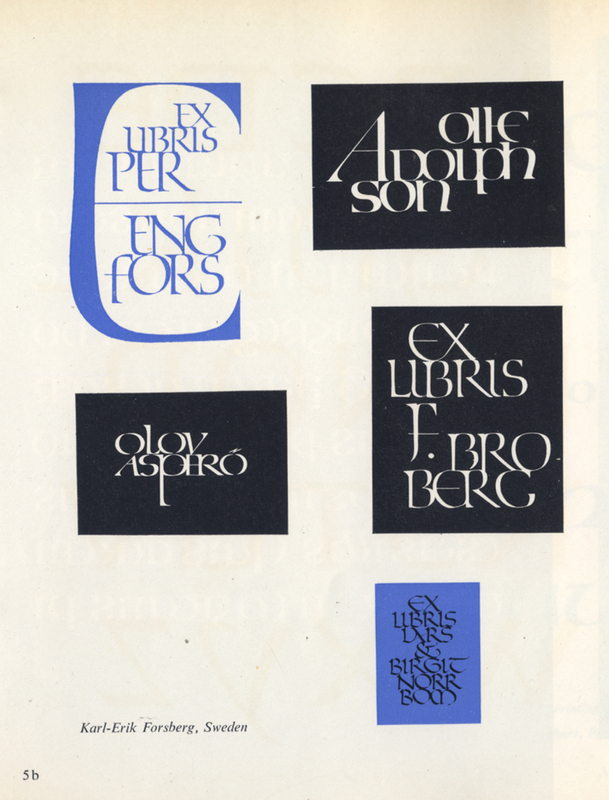 Five ex libris designs by Karl-Erik Forsberg from ABC of Lettering and Printing Types by Erik Lindegren (New York: Pentalic Corporation, 1976), p. 69. 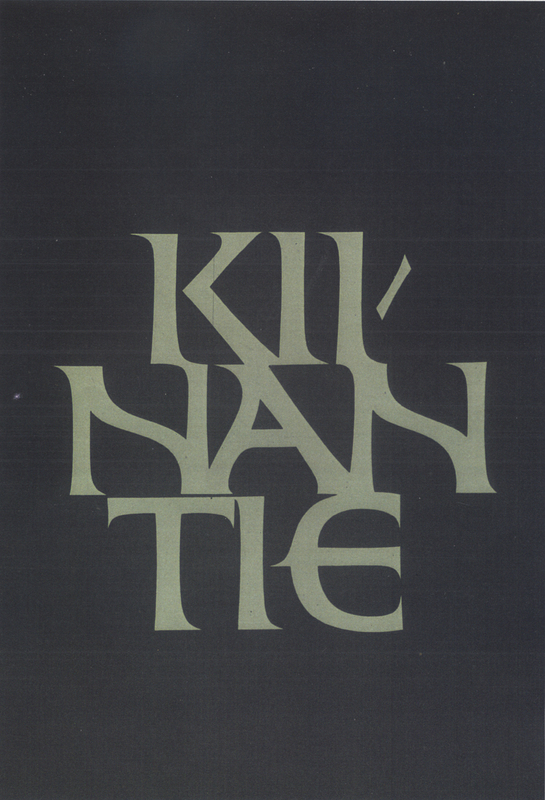 Film title lettering (c.1984) by Erkki Ruuhinen. Uppsala drawing (detail) from late 1997. 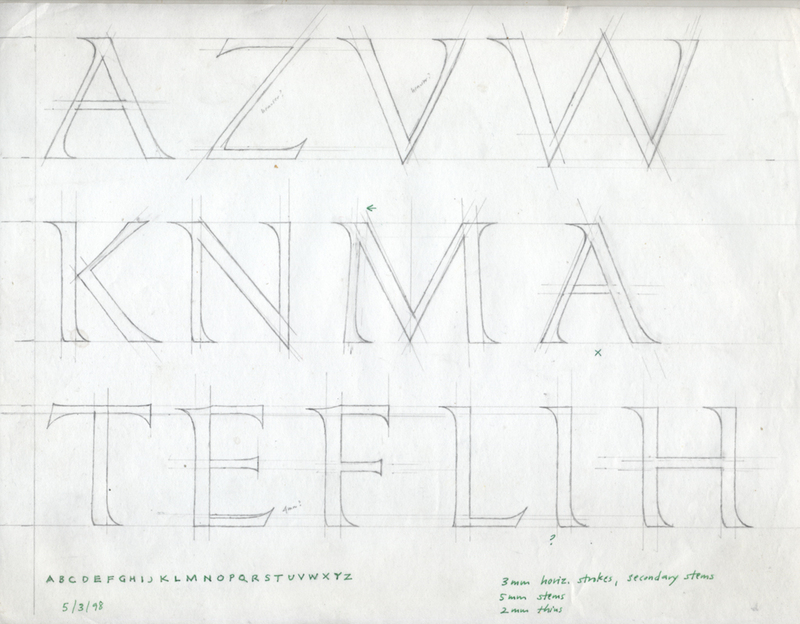 This undated sheet (only the left side is shown above) from 1997 (probably December) is the earliest drawing following the sheets of exploratory sketches. Some odd possibilities for letters such as O were still being considered. But the design was quickly moving toward a squarish look, similar to that of Gunter Gerhard Lange’s Solemnis (H. Berthold GmbH, 1954) and the custom alphabet designed by Adrian Wilson and Herbert Marcelin as titling lettering and initials for The Oresteia by Aeschylus (New York: Limited Editions Club, 1961) (see Lindegren 1976, p. 69). The undated proof is probably from July 1998 and shows the evolution of the key round letters (C, E, G, O, Q and S) between April and August. The ﬁnal version of Uppsala can be seen in the type design section of this website. Göteborg was originally called Askim, after the small town where Erik Lindegren’s graphic design studio was based. The name was changed when Raven became Stockholm so that all of the fonts in the set would have the names of major Swedish cities. Göteborg is near Askim. We stuck to the hard-to-pronounce Swedish name (“Yeutebory”) rather than the English name Gothenburg in order to emphasize the Swedishness of the set. We also wanted to avoid association with Heinrich Heinrichsen’s fraktur face Gotenburg (D. Stempel AG, 1935–1937) which has sometimes been called Gothenburg. 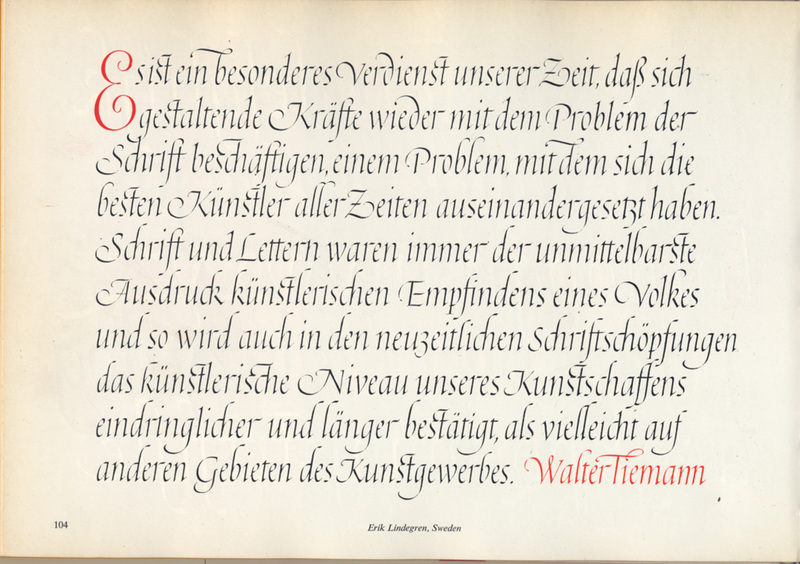 Quotation from Walter Tiemann written out by Erik Lindegren. (ABC of Lettering and Printing Types, vol. A, 1964, p. 104). The principal inspiration for Göteborg was this quotation from Walter Tiemann that Erik Lindegren included in volume A of his ABC of Lettering and Printing Types (1964). It is one of my favorite examples of a modern italic hand. (The Ti ligature is fabulous.). Trying to capture its lively spirit in type was an impossible task and one that I quickly abandoned in favor of making a typeface that would have Lindegren’s distinctive spiky flavor. I referred to other examples of italic by him in his other books, though none of them matched this one in vitality. These two pages from Lindegren’s 1976 book provide a full showing of his distinctive italic, but they made my job harder rather than easier. 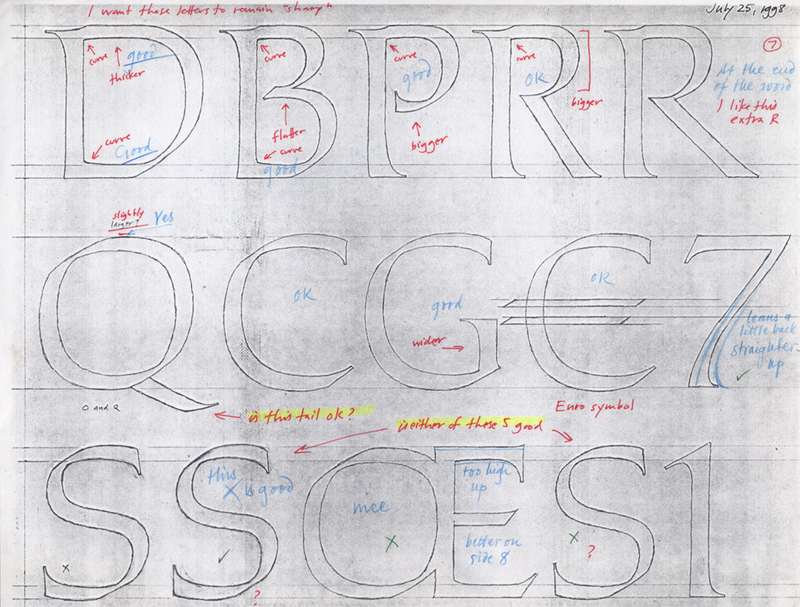 The letters of the swash capital alphabet have been designed to ﬁt a layout not as members of a typeface. Thus, A, J, N, T, Y and Z have excessively long swash tails; the swash stems on B, D, H, L and P are inconsistent in height and there are none for E, F, K, M, N or R; and many letters have serifs. The minuscules are equally confounding as Lindegren has included several odd alternate characters (note especially the uncial e, odd k, wide s and blackletter-ﬂavored v and w); both swashed and seriffed ascenders; and, most importantly, ﬂattening on the arches of h, m, n, etc. Some of these characters did not belong in a typeface and some of these features contradicted features I especially liked in the Tiemann quotation italic. I stuck to the former as my principal model for Göteborg. early sketches defining the key forms and features of Göteborg (November 1997). The sheet above was an early attempt to establish the basic features of the Swedish modern italic typeface: a pen angle of 45°, a ratio of stroke width to x-height of 6 pw (pen widths) which is lighter than the traditional cancellaresca corsiva, a slope of 8.5°, high branching, beak serifs in place of entry strokes, sharp exit strokes, and a slight waisting or thinning of stems. 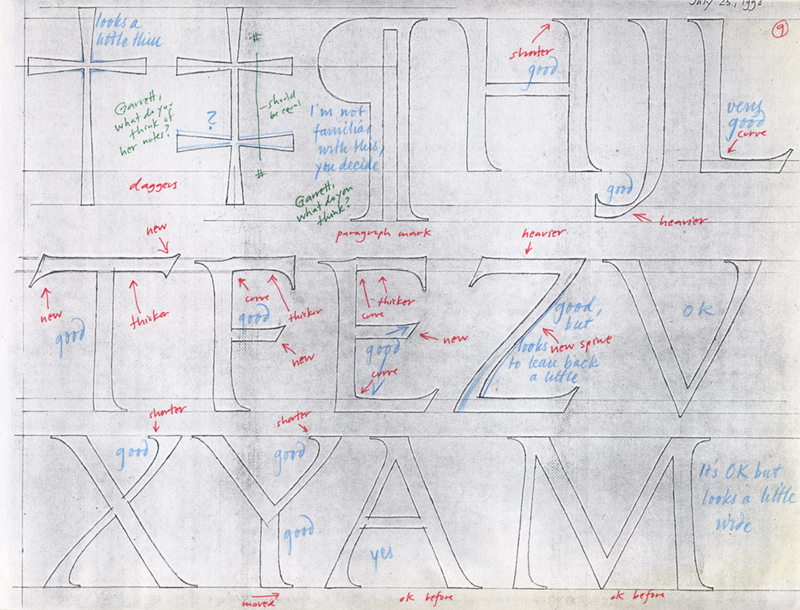 The possibility of designing swash ascenders and descenders was still open at this point. 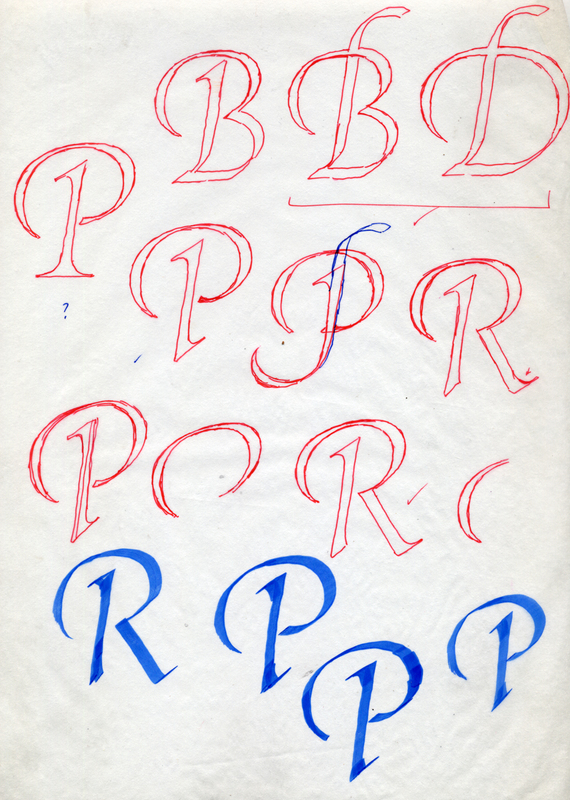 sketches for swash capitals P and R in Göteborg (early 1998). This undated sheet of tracing paper shows my attempt to ﬁgure out the method of terminating the stem of P and R (and, by extension, F, K and T) as well as the difﬁcult shape of the P bowl with its swash extension. First drawing of Göteborg lowercase letters (21 December 1997). The ﬁrst pencil drawing of the Göteborg lowercase included some of the questionable characters from the alphabet in Lindegren’s 1976 book such as the x with a crossbar and the curled d. These were eventually dropped as, regrettably, were the swash ascenders, the e with a tongue swash, and the quaint ct and st ligatures. These latter characters were the casualty of pre-OpenType character sets which required either elaborate strategies of keyboard access (option and option-shift) or placement in separate fonts. 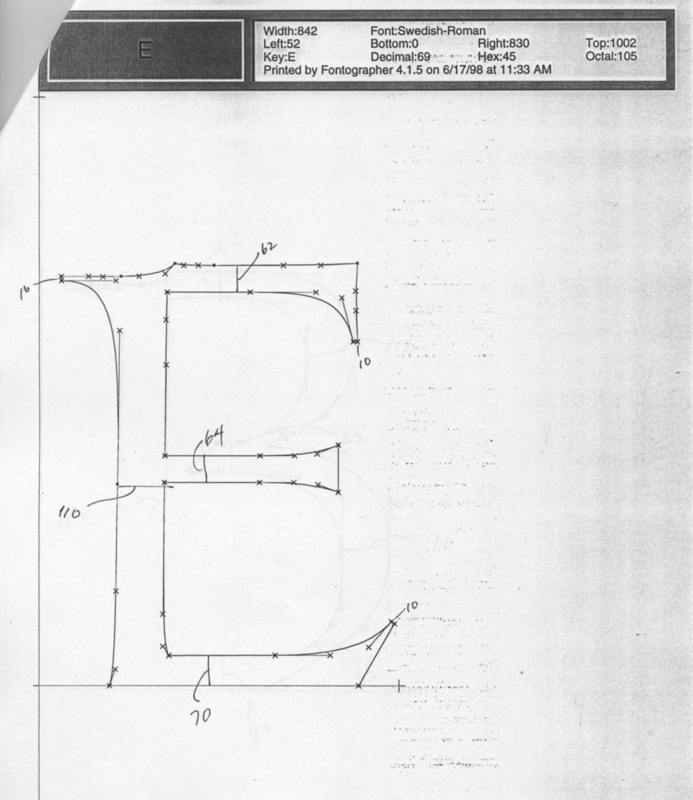 Annotated proof of Göteborg lowercase letters (4 February 1998). 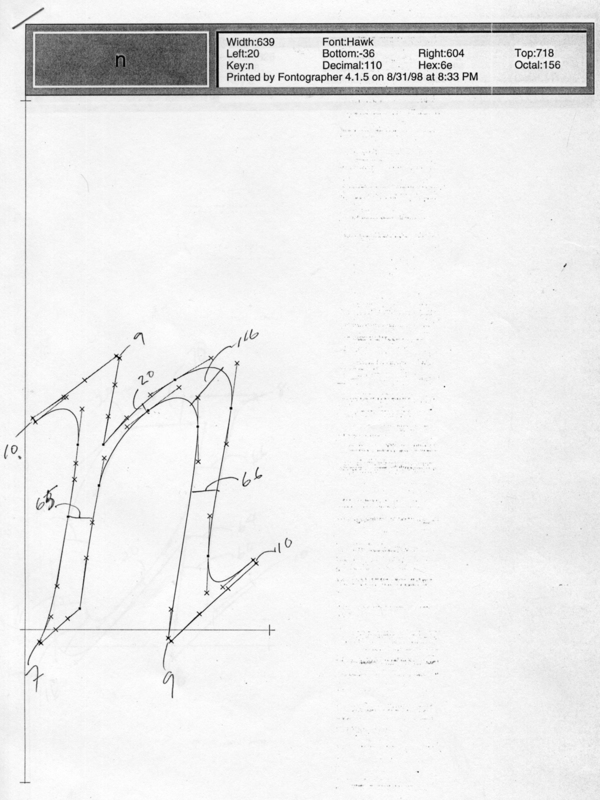 Digitization of lowercase n (31 August 1998). Garrett sent me this sample digitized n to check some of the key points of the essential lowercase letters: slope, entry/exit stroke treatment, stem width, branching, etc. Drawing of some Göteborg swash capitals (17 September 1998). 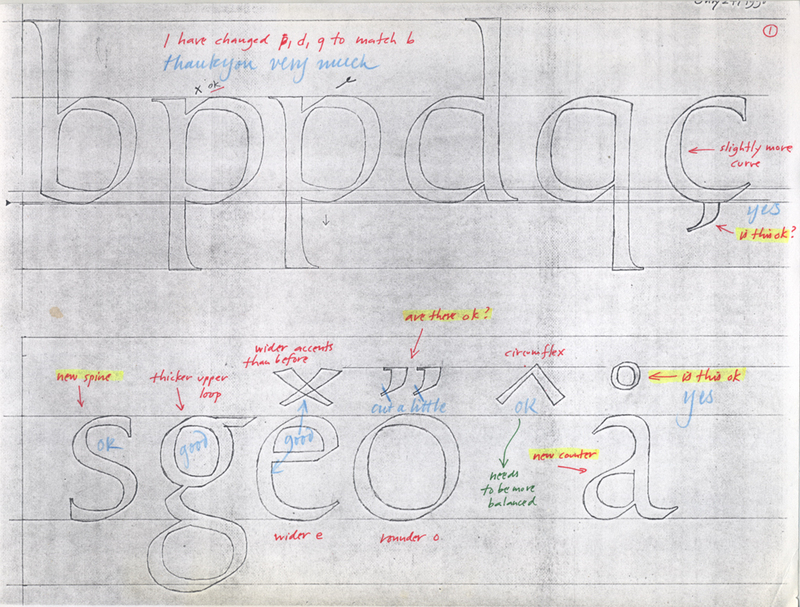 Annotated proof of Göteborg lowercase (9 September 1998). This is essentially the ﬁnal version of Göteborg. The overly long g in the 4 February 1998 proof above remains but the r has been shortened for better spacing. A second g should have been designed. 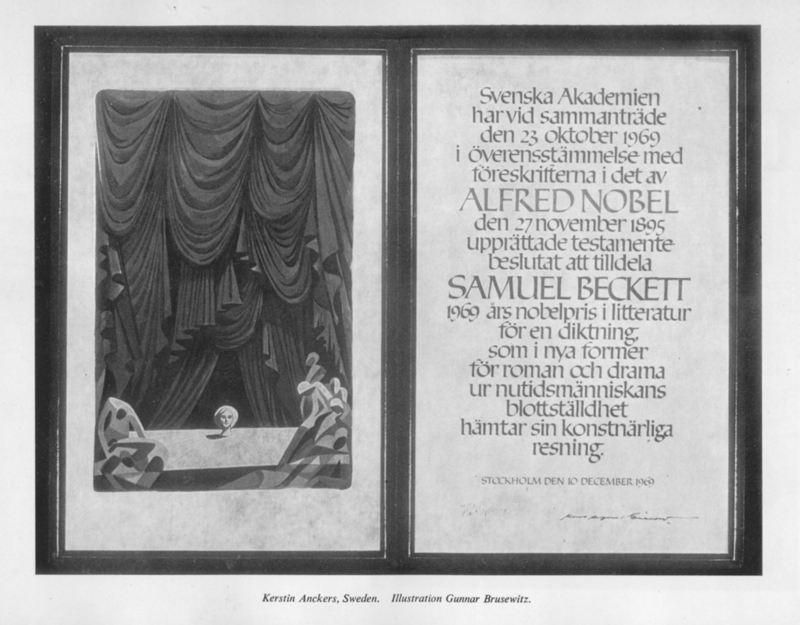 1969 Nobel Prize for Literature to Samuel Beckett. Calligraphy by Kerstin Anckers, illustration by Gunnar Brusewitz. 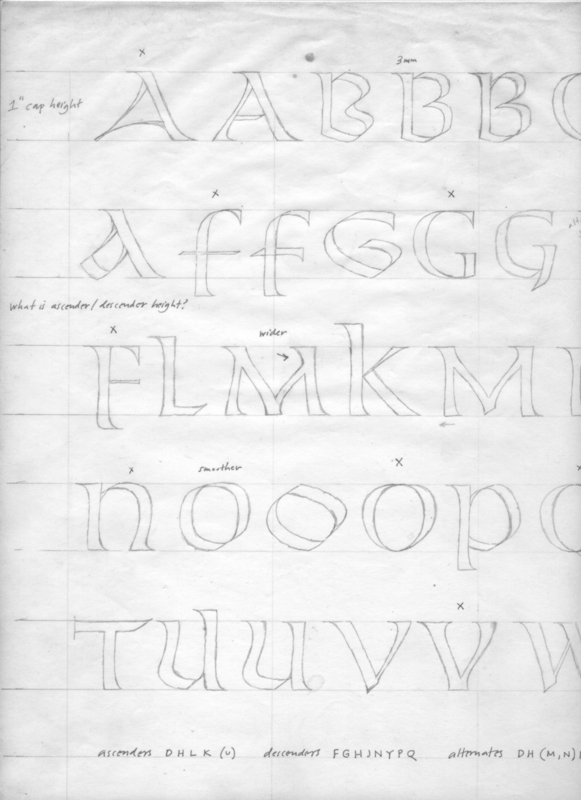 From ABC of Lettering and Printing Types, vol. A (1964). 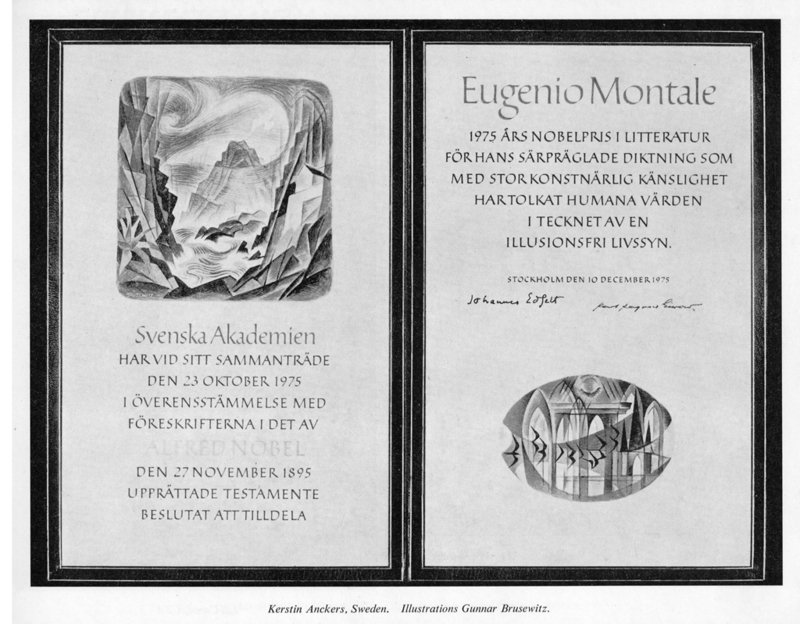 1975 Nobel Prize for Literature to Eugenio Montale. Calligraphy by Kerstin Anckers, illustration by Gunnar Brusewitz. From ABC of Lettering and Printing Types (1976). As indicated earlier, the initial impetus for the Stockholm typeface in the Swedish Modern Set were several of the Nobel Prize for Literature awards designed by Kerstin Anckers, especially those for Samuel Beckett (1969) and Eugenio Montale (1975). They are signiﬁcantly different. The Beckett calligraphy has a very large x-height and tightly packed letters; while the Montale calligraphy is considerably larger with most of the text in capitals. Roman minuscule alphabet by Kerstin Anckers. 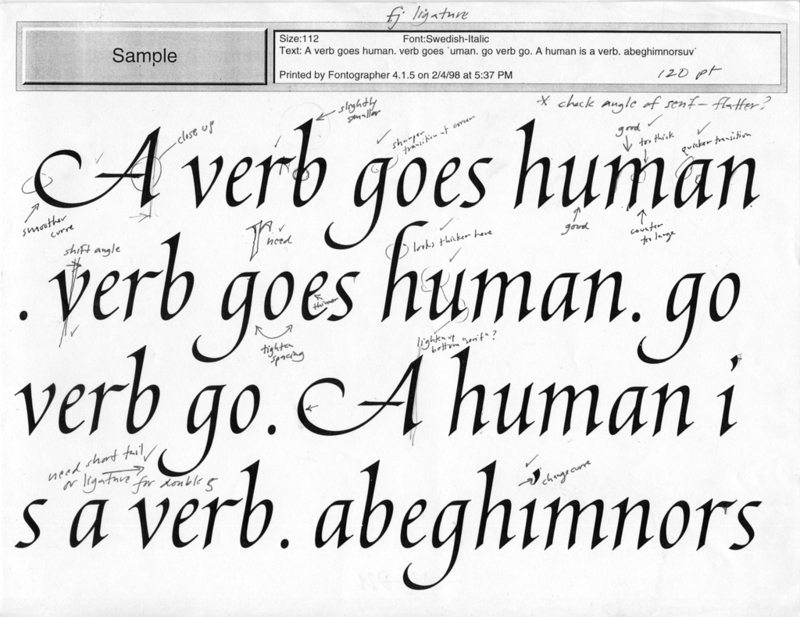 From International Calligraphy Today (1981), p. 107. 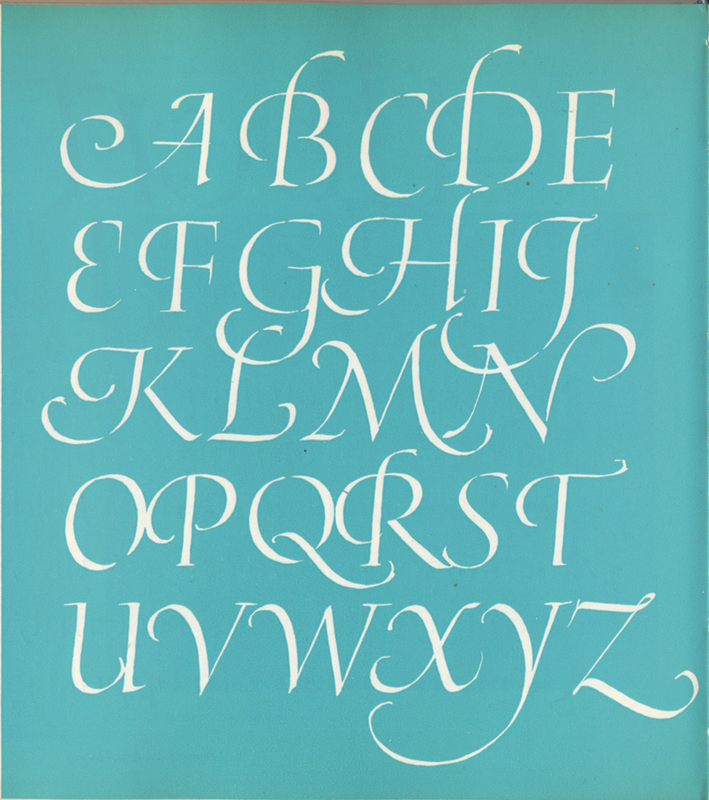 Calligraphy by Kerstin Anckers from ABC of Lettering and Printing Types (1976), p. 97. 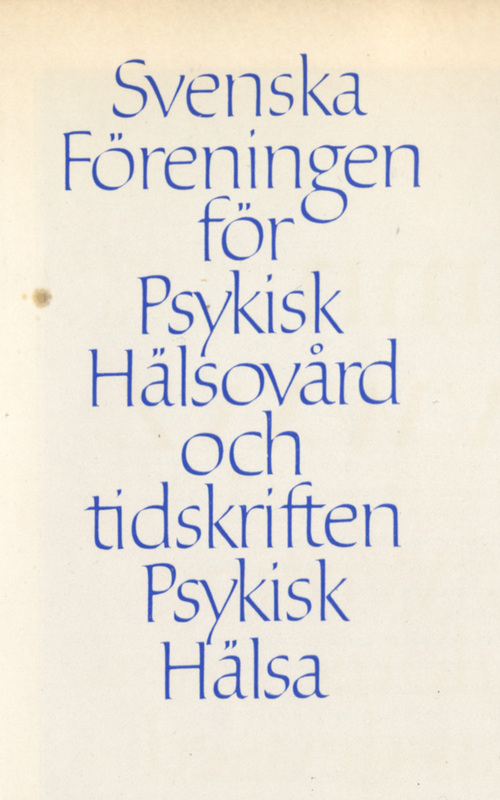 After the Nobel awards sparked the typeface idea I discovered two other examples of Kerstin’s roman calligraphy in my library, an alphabet in International Calligraphy Today (1981) and this undated calligraphy for Svenska Föreningen för Psykisk Hälsovård och tidskrifter Psykisk Hälsa [Mental Health, the journal of the Swedish Association for Mental Health]. Once again, there were distinct differences between them. My preference was for the latter with its lightness and elegance that seemed to match Lindegren’s italic, even though I had no intention of mating the two—contrary to Agfa/Compugraphic’s initial expectations. 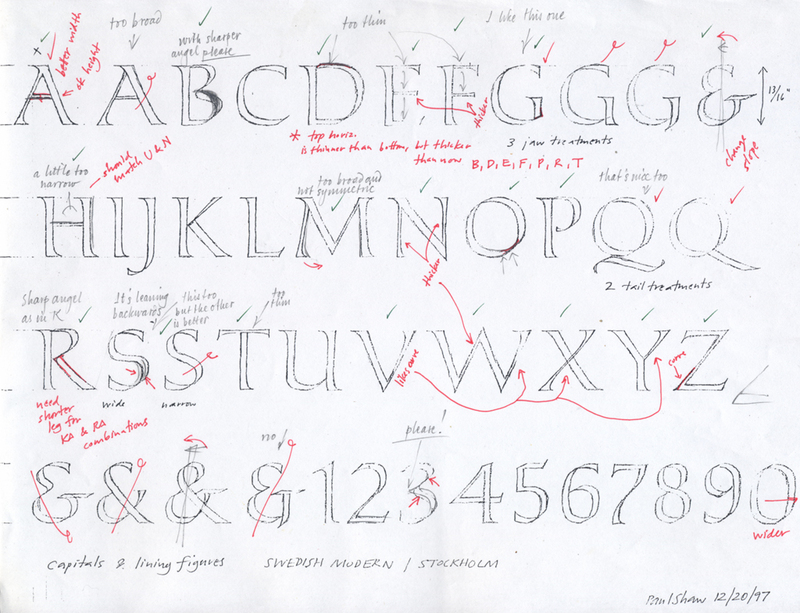 Exploratory drawing of lowercase letters for Stockholm (1997). Left side of sheet. 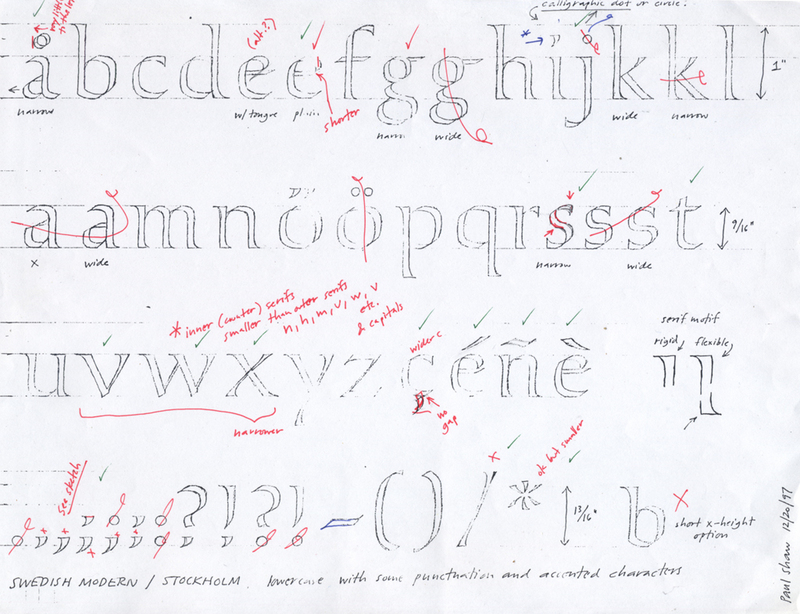 Exploratory drawing of lowercase letters for Stockholm (1997). Right side of sheet. 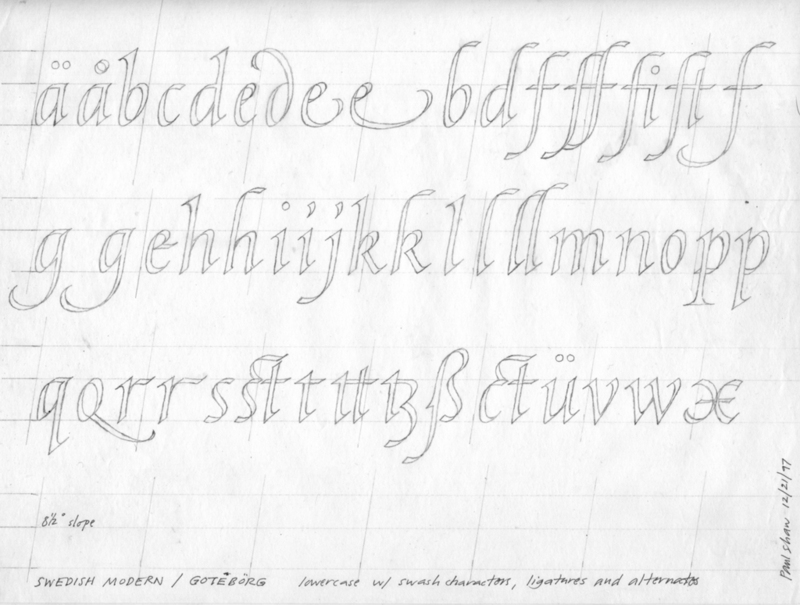 This sheet of exploratory drawings aggregates the various versions of Kerstin’s roman calligraphy. It shows the stark differences among the four sources I had gathered in terms of weight, x-height and individual character shape (e.g. a, e, g and k). Despite beginning the project with the Beckett calligraphy in mind, it continued after this with a cross between the ITC alphabet and the mental health calligraphy as the model for Stockholm. First drawing of Stockholm capitals (20 December 1997) with notes by myself and Kerstin Anckers (January 1998). 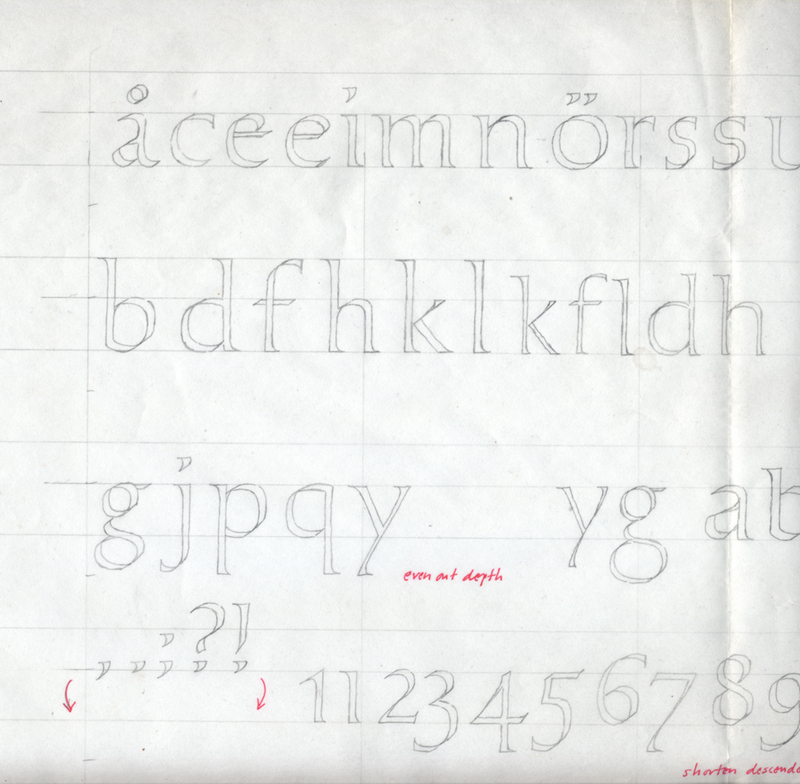 First drawing of Stockholm lowercase (20 December 1997) with notes by myself and Kerstin Anckers (January 1998). These two sheets (marked up faxes of my drawings) are annotated by myself (in red and blue ink) and Kerstin (in green ink and pencil). She was much more critical of my capitals than of my lowercase. (Approved letters are indicated by a check mark). Drawings for selected Stockholm capitals (3 May 1998). Drawings for Stockholm selected lowercase letters (6–7 May 1998). This is a detail from a sheet of tracing paper where I was summarizing Kerstin’s comments on my May drawings. This was probably meant for Garrett as well as for myself so that he would know the new direction the letters were taking. Proof of Stockholm capitals annotated by Kerstin Anckers (6 July 1998). Proof of Stockholm lowercase letters annotated by Kerstin Anckers (6 July 1998). Kerstin’s annotations of my June 1998 revisions are in green ink. All other annotations are mine. Drawings for Stockholm capitals annotated by Kerstin Anckers (25 July 1998). 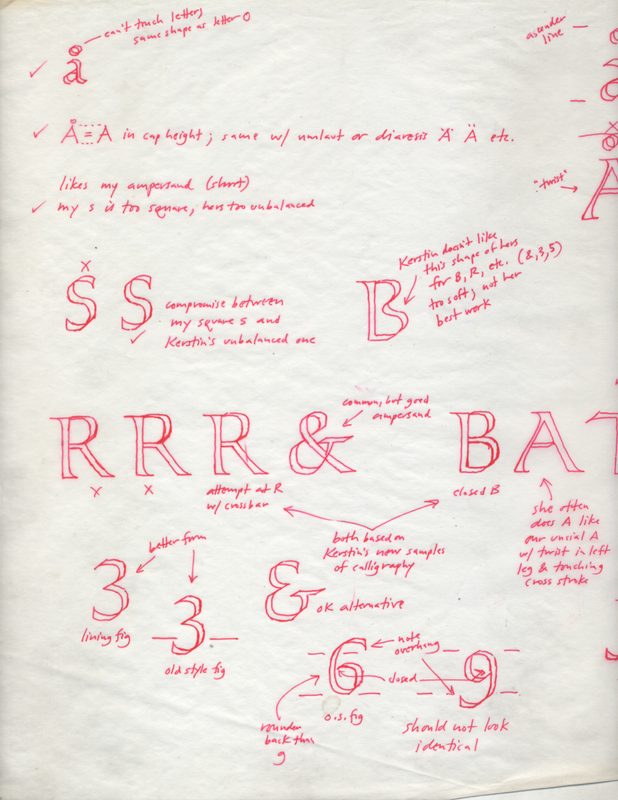 Drawings for Stockholm lowercase letters with annotations by Kerstin Anckers (24 July 1998). These four sheets (out of ﬁve—the one not contains punctuation and symbols) are annotated faxes of my drawings. My notes are in red ink (changed to black if on the drawing prior to faxing) while Kerstin’s are in green ink and blue pencil. (Note the positive comments—e.g. “yes!”, “good” and “thank you” as well as the critical ones.) At this point Stockholm, reflecting her input, had changed signiﬁcantly for the better, becoming softer yet not mushy. 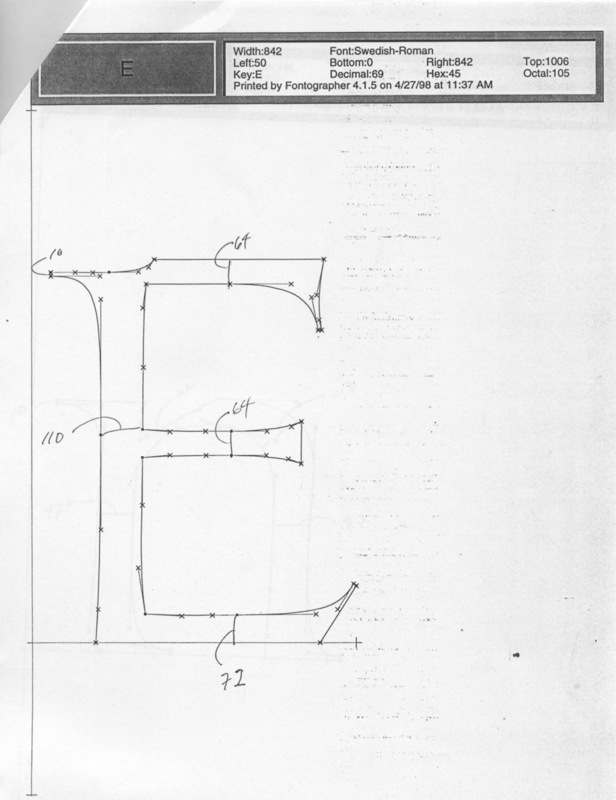 Digital outlines for Stockholm E (27 April 1998). Garrett Boge. Revised digital outline for Stockholm E (17 June 1998). Garrett Boge. These two printouts of the digital outlines of the Stockholm E as it was being revised show the subtlety of Kerstin’s calligraphy that, with her help, I was trying to capture. The juncture of the stem to the lower horizontal stroke has been changed as has the thickness of the latter. Also, the lower left side of the stem has been slightly altered. These documents should make it clear that Kerstin Anckers contributed signiﬁcantly to the quality of the ﬁnal version of Stockholm, whether she was ultimately happy with the font or not. Perhaps Garrett and I (urged on by Agfa/Compugraphic, which was eager to get the Swedish Modern Set to market) stopped the process of revising the design too soon. On the other hand, that process may have gone on forever as I tried to continually reﬁne each letter to match a speciﬁc version of her calligraphy she had in mind—which was not always in sync with other versions of her calligraphy that I had in mind. In the end, the only possible way to have satisﬁed her would have been to have begun the project with a new alphabet drawn by her—something which she never offered, even at the outset—rather than with existing conﬂicting examples of her calligraphy.